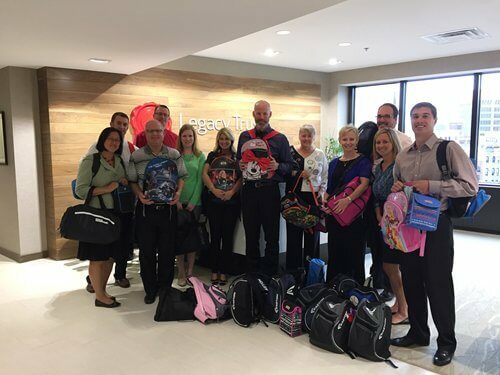 Legacy Trust employees participated in Family Promise’s Back to School Backpack Campaign again this year! The team worked together to purchase items and fill the backpacks for children in need at Family Promise. Family Promise is a nonprofit organization that provides hospitality to homeless families and keeping them together in a time of crisis. Legacy Trust had 100% employee participation in this volunteer activity. We are proud of our employees and the depth of their generosity. We gathered such an abundance of school supplies and other items that we could barely fit everything into the backpacks. We therefore decided to add and fill lunch bags to utilize all of the donations made to this project. The backpacks and lunch bags were filled to capacity with school supplies, snacks, toothbrushes and toothpaste, and other goodies. We are very happy to be able to partner with Family Promise and help the children of these families start school on a high note, and ensure they have the proper tools to prepare for success in the classroom.